"While these two are great players, the numbers just don't say they're worth 30 to 40 million dollars a year" doesn't exactly tell the whole story, especially when you're not specifying which numbers you're using. Per Spotrac, seven MLB players made $30 million or more last year, with three more at $28 million or above. Only three of those players (Mike Trout, Max Scherzer and Justin Verlander) were in the top 10 in FanGraphs’ calculation of wins above replacement in 2018. Granted, Machado and Harper weren’t there either, producing 6.2 and 3.5 WAR respectively, but Machado was 14th, well ahead of top-10 salaried players like Albert Pujols ($28 million, -0.2 WAR), Miguel Cabrera ($30 million, 0.7 WAR) and Yoenis Cespedes ($29 million, 0.9 WAR). Of course, Cabrera was done for the season with a biceps injury in June and Cespedes was shut down with a heel injury in July, so their WAR numbers aren’t for a full season, but having either Machado or Harper (both 26, so much younger than those others) for the price of $30 to $40 million annually would look considerably better than any of those guys right now, and it would look considerably than numerous other players high on the salary list. So just saying “the numbers just don’t say they’re worth $30 to $40 million a year” doesn’t seem accurate, and there doesn’t seem to be any particularly reason why Harper and Machado shouldn’t be paid in that range, unless the market has fundamentally shifted away from what got those other players their deals. But Machado and Harper aren’t getting those offers. …Baseball drove down a road that looked suspiciously like this one between 1985 and 1987 and that ended in a multicar collision with three separate findings that its owners had engaged in illegal collusion to hold down player salaries. The owners paid penalties of $280 million plus interest to the players, and in the 1990s the sport weathered brutal strikes that owed to the residual bitterness. Look, no one’s expecting Teixeira to be the intrepid reporter who breaks a collusion story wide open, or even to have him directly accuse baseball of collusion. 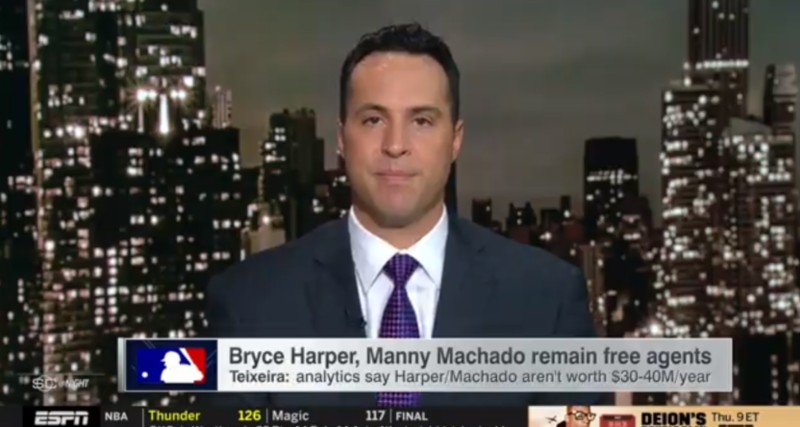 And we know that ESPN frowns upon claims about rights partners that aren’t thoroughly proven; if you can’t say that Roger Goodell’s a liar, you probably can’t say that baseball’s colluding to keep the Machado and Harper contracts down. But there are ways to at least mildly address the idea, even without mentioning “collusion” itself. Even just a “the players’ association isn’t happy about what appears to be a lower market for free agents despite no corresponding revenue decline” would have sufficed, and that wouldn’t even make it Teixeira’s opinion. And if he really, truly believes that “analytics” are the reason these players aren’t signed, he could bring up the players’ association’s comments and then try to refute them, arguing just what “analytics” indicate that. But that’s certainly not a conclusion held by a lot of analytics-emphasizing writers, and it’s certainly not the main narrative out there about why Machado and Harper haven’t been signed yet. And Teixeira billing “analytics” as the obvious scapegoat while neglecting to even address the collusion elephant in the room made for an odd segment, and one that was a disservice to ESPN viewers.